Taught to the tune of the hickory stick. Music by Gus Edwards; Lyrics by Will D. Cobb, 1907. If one follows Whipple Road eastward away from Douglas Pike into the Town of Lincoln, they will come to the intersection of Angell Road where one of Smithfield’s (now Lincoln’s) earliest one-room schoolhouses remains standing. Although the building has seen better days, it can still evoke images of a simpler time when teachers called students to class by ringing a bell, and when lessons for all grades were taught in the same classroom. This was the Pullen’s Corner School, and prior to the division of the Town of Smithfield in 1871, it was located in what was once the heart of Smithfield’s School District No. 19. Few former schools of this type have withstood the ravages of time, most having succumbed to neglect and the wrecking ball. The Pullen’s Corner School is therefore special for having survived in its original condition, and at its original location for more than 160 years. Not only has the school survived, but so has a rare hand-written ledger which contains the minutes of school committee meetings held in the building between 1859 and 1888. The ledger, presently in the possession of the Historical Society of Smithfield, recounts teacher appointments, contracts, operating expenses, and other business concerning the building itself. The first school districts in Rhode Island were established in 1800 with the passage of the Free School Act, which allowed for the free public education of children. It is said that Smithfield was one of the first towns in the state to adopt school districts. Each district was initially administered to by an elected board of neighborhood taxpayers who had the same authority and responsibilities as a town-wide school committee does today. Each district committee consisted of a clerk, a trustee, a treasurer, and a tax collector. Elections were generally held every spring, and one had to be a “qualified” voter of the district to have any say in matters pertaining to the school. To be “qualified” likely meant owning property and paying taxes on it. The district school committees hired teachers, saw to necessary repairs of the school, and levied taxes to pay for such things. Town-wide school committees didn’t come into being until after 1840. By 1870, Smithfield had thirty-six school districts. This was a time when the Town of Smithfield included the present-day municipalities of North Smithfield, Lincoln, Central Falls, and a portion of Woonsocket. As the population grew, so did the number of school districts. Exactly how the district lines were drawn is unclear, but one could surmise that population density had something to do with it. In a day before school busses, schools, it seems, had to be within a reasonable walking distance. 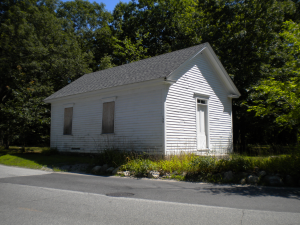 One-room school houses as we think of them today didn’t become part of the landscape until the mid-1800s. Prior to that, classes were usually held in a rented room of a private residence. If a home was unavailable, there was always the back room of a business. In Greenville, for example, school was once taught in the famed Waterman Tavern. The Pullen’s Corner School was built in 1850 and closed in 1922. Therefore, it can be assumed that the previously mentioned hand-written ledger was the second in a series of ledgers, but it is the only one known to have survived. Page one defines the boundaries of the district much like a land deed would describe the parameters of a large piece of property. The district was irregular in shape, but the western boundary ran parallel to Douglas Pike between the pike and Ridge Road all the way to the North Providence line, while the northern boundary extended north of Jenckes Hill Road, and took in land presently owned by the Community College of Rhode Island. At a meeting held on April 23, 1859, the following people were elected to the district school committee for the term of one year: Lyman Arnold, Clerk; George A. Angell, Trustee; Ethan E. Angell, Treasurer; Alphonse A. Draper, Collector. The records also show that each man took an oath of office swearing to uphold the Constitution of the Untied States and the laws of Rhode Island. It should be noted that district school committees set the parameters for the “school year” based on several factors, one of which being the needs of local farmers who required their children to help with spring planting and the autumn harvest. It made no sense to schedule classes when parents would only keep their children home due to economic necessity. To make up for the short winter sessions, many schools also ran classes during the summer. The carefree days of summer enjoyed by today’s youth were not so carefree back then. Children would rise with the sun to do chores before heading off to school, only to return late in the day to do more chores. An entry for May 14, 1860, reveals that Miss Jane Smith was appointed to teach from May 14, to September 21, 1860, her salary set at fifteen dollars per month. Judging by the ledger, teacher compensation appears to have been arbitrary, with only one hard and fast rule; that male teachers made more than their female counterparts. Pay for male teachers ranged from $27 to $35 per month, while female teachers generally received about half as much. Even when hired on a weekly basis, a female teacher could only expect to receive between four to six dollars per week. While some teachers did receive pay raises, the raise was usually small for both sexes. An entry from 1870 listed expenses incurred by the district for that year: one clock, two dollars; one dictionary, five dollars; brush and duster, eighty cents; stove pipe, thirty-five cents; one map, two dollars and seventy-five cents; broom and chalk, one dollar and four cents; wood for building fires, six dollars; one pail, twenty-five cents. Missing from this list of items is any mention of money expended on building maintenance, yet paging through the ledger it would appear that keeping the school house in good repair was an ongoing battle. One might also draw the conclusion that allocating money for necessary repairs wasn’t a priority for some. An entry dated December 21, 1863 under “Notice of Special School Meeting”, cites that the meeting was, “for the purpose of voting a tax on the said ratable property of said district for the purpose of repairing the school house.” The actual meeting was held four days later, on Christmas, with nine qualified voters present. A vote was passed to levy a tax of $150 to repair the school. This tax levy also had to be approved by the town school committee, which it was, on January 12, 1864. In 1871, the Town of Lincoln was set apart from Smithfield, and District 19 of Smithfield became District 12 of Lincoln. Records indicate that the transition was relatively smooth. The first meeting for District 12 in the new Town of Lincoln took place at the school on June 24, 1871. The matter of repairing the school was revisited in1876, but with much debate and controversy. Some wanted to repair the present building which was barely twenty-six years old, while others wanted to build an entirely new school house at another location. The argument dragged on for three years until it was voted four to eight to build a new school, the cost of which was not to exceed one-thousand dollars. The old school was to be sold at auction. It appeared that the matter had finally been settled, however it was not. Another vote was taken two weeks later on June 27th, where five voted to build a new school, but eight voted to repair the old one. The vote might have been tied had all eight of those who voted to build a new school at the previous meeting had attended this one. Those wanting a new school vowed to fight on, and two days later yet another meeting on the matter was held. The vote from the 27th was rescinded, and once again it was voted to build a new school. However, that vote was declared null and void at yet another meeting held on the 29th, where it was once again decided that the old school should be repaired and not abandoned. Despite the back and fourth in-fighting, it appears that no immediate action was taken either way, for there is no further mention of repairs until a meeting held on June 24, 1882, but it was written in the ledger that no vote was taken for lack of attendance. History shows that the Pullen’s Corner School was eventually repaired as it remained in operation until 1922. There is a charming legend connected to the school concerning how it earned the nickname as the “Hot Potato School”. The story goes that a teacher, presumed to be a Miss Estelle Collier, donated a stove on which she would bake and boil potatoes donated by local farmers so that the children could receive hot lunches. The old school is a symbol of a bygone era; a piece of yesteryear Americana that has all but disappeared from the New England landscape. For this reason there are those who feel it is worth preserving. To that end, two Lincoln residents, Richard A. Di Mase, and David Sale, have formed a two-man preservation committee dedicated to saving the building. Over the last sixteen years they have raised funds through the sales of special Christmas ornaments depicting the old school. Each year, a Lincoln company known as Chem Art has produced a different customized ornament to help the cause. According to Mr. Di Mase, the long term goal is to have the building moved from its present location to the grounds of the new Lincoln Middle School where it can be restored to its former glory, and once again used for educational purposes.